PrimeSense was selected by MIT as one of the world’s 50 most innovative companies for 2011. What is PrimeSense doing in 2012 to stay innovative in markets outside the living room such as digital signage, security and robotics? In the last 5 years, consumer devices have gone through significant revolutions – Music Players, Mobile Phones and Tablets have all turned into feature and content-rich devices, providing attractive design, New UI, Internet access, abundance of Content and Apps, Multi Functional qualities and more. When probing beyond these new features and functionalities, we recognize two main paradigms that have enabled these revolutions – the entire experience has shifted, placing the user in the center, and allowing them to choose any content and any app, anytime. All this is enabled through new User Experience control paradigms – keyboard to mouse, mouse to touch, and soon – touch to gesture. PrimeSense is leading the charge with Natural Interaction and gesture technology as the new paradigm. PrimeSense is a visionary company that is transforming devices by giving the gift of sight, enabling them to view and interact with their environment. PrimeSense solutions completely revolutionized the gaming industry in 2011, and are still making huge changes in the Living Room TV and Entertainment industry. PrimeSense is the only 3D sensing solution company that has reached mass production and has invested in the technology to scale across any vertical allowing PrimeSense to make innovations in other markets. Following substantial demand from the industry, we are starting to see development in new arenas including robotics (machine vision), digital signage, industrial, medical, retail and security. What is the OpenNI organization and what are developers doing there now? OpenNI (www.openni.org) an industry-led, not-for-profit organization formed to certify and promote the compatibility and interoperability of Natural Interaction (NI) devices, applications and middleware. OpenNI makes developing motion games and applications easy and quick. Using OpennI and a variety of developer platforms such as Unity3D, game developers can easily port their existing games to a motion based platform. The OpennI arena also offers developers a platform for showcasing their work with the potential to actually reach prospective customers and end users, thus providing monetization opportunities for a budding industry. PrimeSense is the only company that has a 3D sensing solution that has reached mass market (with Kinect) and now the company is looking towards the multitude of other applications. PrimeSense created OpenNI to offer developers an open standard for development of Natural Interaction apps and games. Natural Interaction is now a reality in 20 million households. How did it get that way and what Key trends do you see for the future of Natural Interaction? Indeed Natural Interaction™ took off very quick and today it is available in around 20m households. We think one of the reasons is that it simply provides a great experience, very intuitive, and natural, and as we saw with the iPhone and iPad, in consumer devices it’s all about the experience. We are still pursuing the living room entertainment environment with fantastic responses from the TV industry. We showed the new reach™ UX at CES which brings to life a new TV user experience that combines motion and gesture control, content discovery and user awareness. This paradigm places the user at the center of an immersive, all-encompassing experience that enables multi-functional TV. With the new personal living room, PrimeSense is reinventing the living room content discovery experience and opening up a whole new world of motion controlled apps from virtual shopping to fitness and more, many of which are developed by members of the OpenNI™ developer community. At CES, PrimeSense launched reach ™ UX. Can you provide some more details on reach ™ UX and how it transforms the television into a giant motion controlled tablet? Using Natural Interaction®, PrimeSense’s reach™ UX turns the TV into a connected media hub with the user controlling all information and data through simple and intuitive gestures. 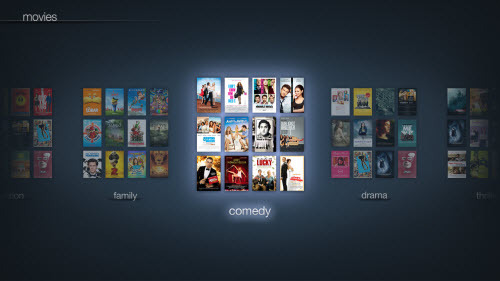 The solution also allows the television or connected device such as a set-top box to recognize the users and differentiate between them and their guests, therefore providing a fully tailored service, which includes user defined preferences, favorite channels, personalized search, friends’ recommendations and much more. reach™ UX is unlike any content discovery experience you’ve ever seen before, it’s truly magical. It brings excitement and joy back to the living room. Users now have a fun and intuitive way to search and navigate the abundance of content and services that Smart TVs can offer. Basically , reach UX transforms the living room TV into a large motion controlled screen, improving on the familiar touch-tablet experience while allowing you to remain leaning backwards on your couch. How effective is a gesture based system in a “busy” environment (e.g. a family room with a few kids running around)? The solution is very smart, so it actually knows who is now controlling the TV, and only that person has control. So all others will not interfere. Even regarding the controlling person, the TV will know if he really intends to change channel, or if he is pointing his fingers at something else. That’s what you can achieve when your TV becomes real smart, like us. What light level is required? For example, can I use it in a dark home theater? The level of light doesn't matter. Day or night, with lamps on or no lights on, regardless of the color of your walls or what you're wearing the sensor can see and understand you. Are people with disabilities left out when it comes to gesture control? No, In fact the PrimeSense sensor has been tested for work with people with disabilities. However in any solution, there will be certain cases in which it will not fit 100% of the people all of the times. OK, I’m sold. I want gesture control for my MediaServer/SmartTV now. Which products are available for purchase now? Right now you can utilize PrimeSense gesture and 3D sensing solutions in your living room with an Xbox Kinect or ASUS Wavi Xtion (http://event.asus.com/wavi/Product/WAVI_Xtion.aspx).